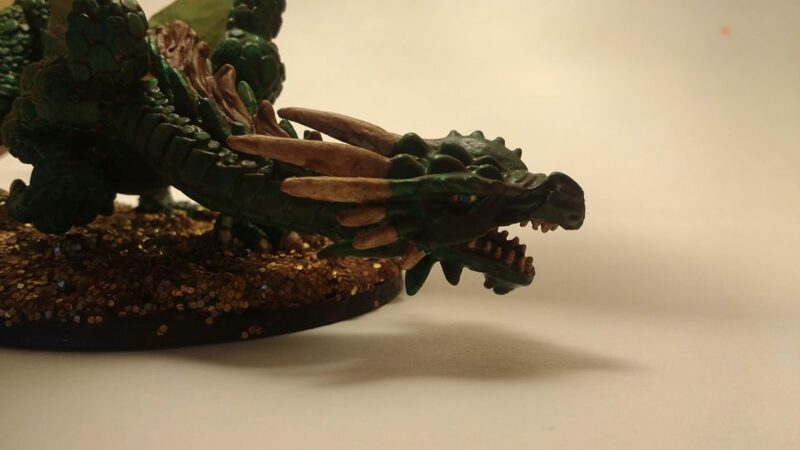 I had such a great time painting Marthrangul, Great Dragon as a White Dragon that I decided to order a second copy and paint it again as another type of dragon. I considered Red or Black but finally settled on Green. 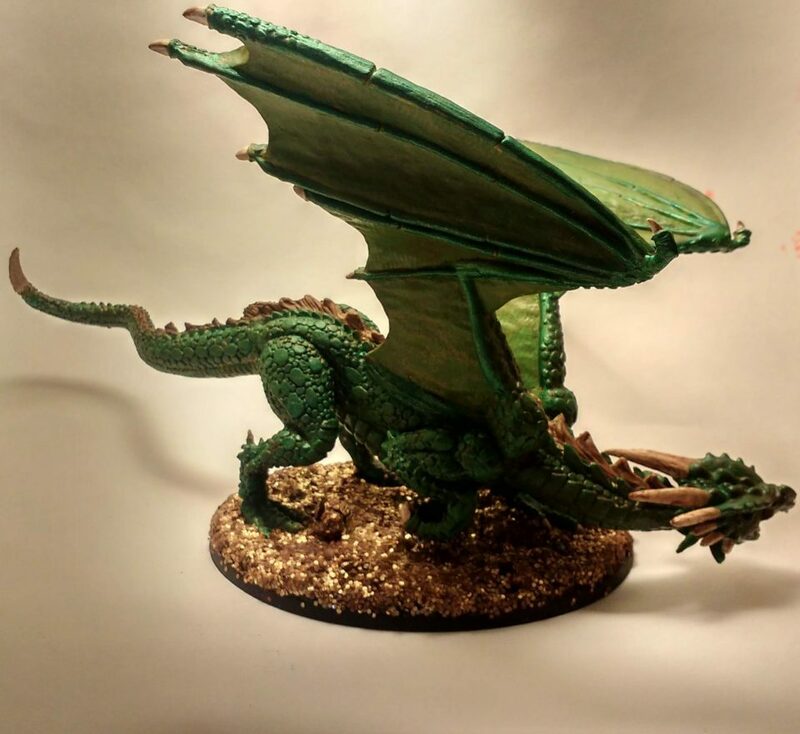 Green Dragons are not one of my favorite types but they are the classic. I decided to go for a treasure trove base for this particular Dragon. I had considered doing this with Blightfang but wasn’t feeling quite ambitious enough. I ended up following the Youtube video embedded below and it worked like a charm…but I probably could have added more bling. 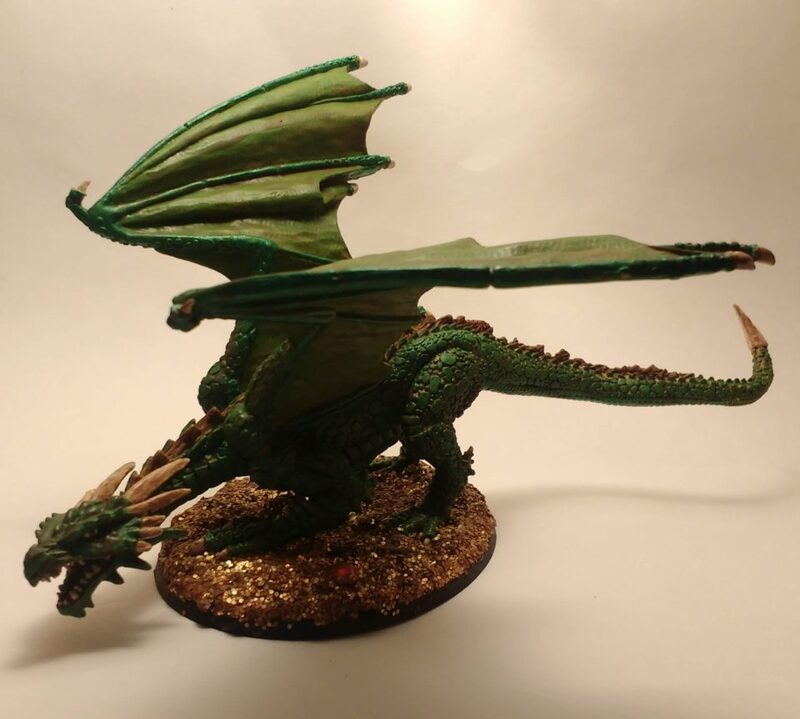 I think I still prefer the White Dragon but I’m quite pleased with how this Green Dragon turned out. Who knows – maybe this will be the start of a series? A Marthrangul in every color? I started with a neon basecoat, covered that with gold, and then drybrushed on several layers of green. Starting dark and going light. Similar take on the wing membranes. I coated it all in polyurethane per the DIP Method (only brushed on) which took the shininess of the gold down significantly. It also obscured most of the gems. Next time I use this technique I’ll have to add more bling and go a bit lighter on the polyurethane. I decided to enter this miniature in Michael Mordor’s July painting contest. Mostly for the close up of the two dragons together.